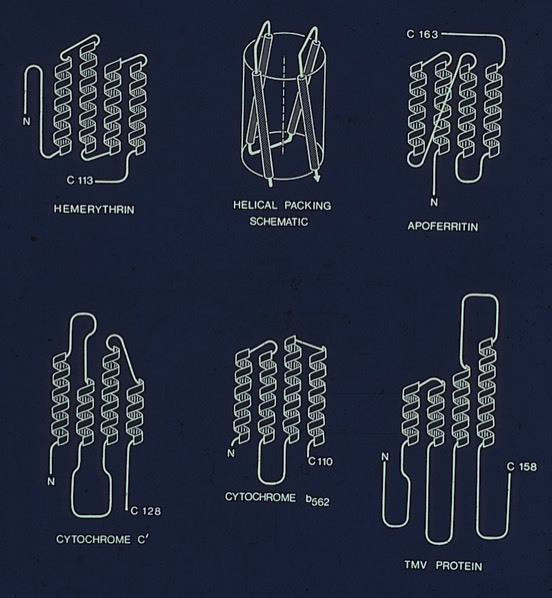 As the number of 3D protein structures began to multiply in the 1970's, I became interested in recurrent structural motifs in proteins, particularly those that did not appear to depend on highly specific features of amino acid sequence. 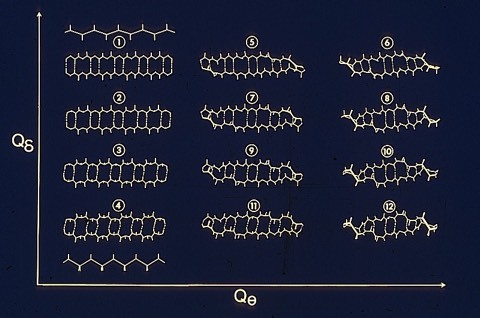 Beta sheet conformationss were of particular interest since their structural organization as bounded minimal surfaces (think soap films) offered a principle for the global organization of protein structure. 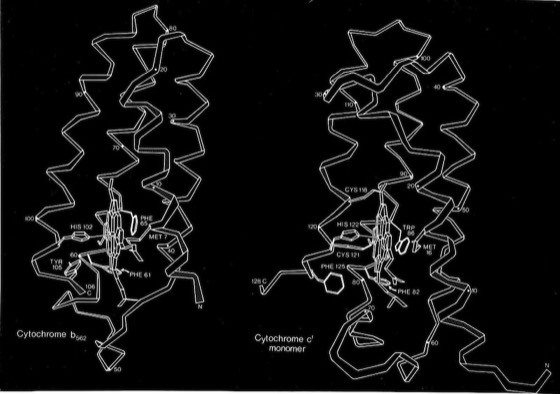 The structure determination of cytochrome c' carried out with Dr. Patricia Weber defined the classical "4-alpha helical bundle". This motif has subsequently been observed as a common structural arrangement found in many natural proteins, and has also been used a template for numerous synthetic efforts. 16. Peptide Models for the Study of Coupled Conformational Properties of Protein Secondary Structures. F.R. Salemme, J. Mol. Biol. 1979; 126: 591-595. This paper describes large scale mechanical models of polypeptides that I built to study coupled motions in proteins. I observed that many extended hydrogen-bonded structures (and particularly antiparallel beta sheets) could undergo large and defined conformational changes that preserved sheet H-bonding. Mechanically speaking, the sheets formed a connected system of non-orrthogonal space-cranks, a very poorly studied mechanical linkage system. 17. 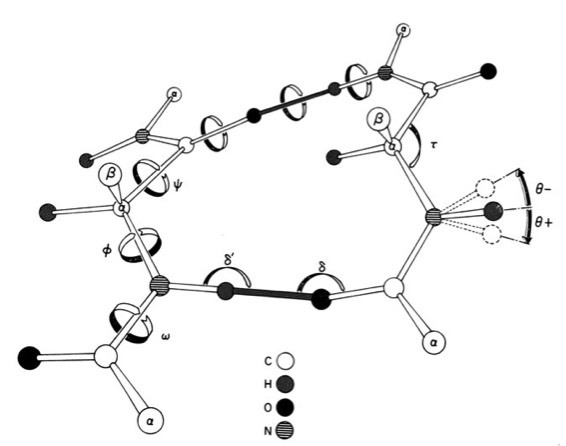 Conformations of Twisted Parallel ß-Sheets and the Origin of Chirality in Protein Structures. D.W. Weatherford & F.R. Salemme, Proc. Natl. Acad. Sci. USA 1979; 76: 19-23. 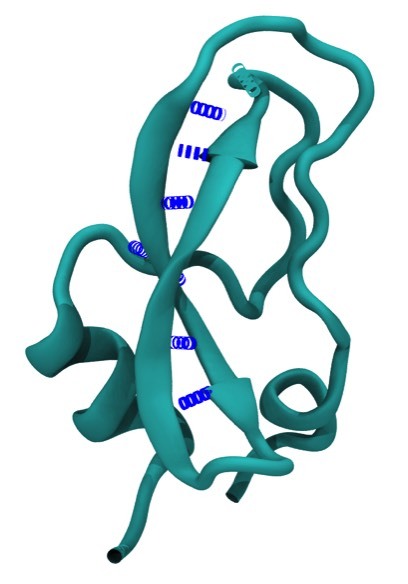 David Weatherford worked with me as a graduate student at UAZ and developed a computational modeling system that allowed us to study the detailed conformational properties of protein beta sheets. One of the first studies examined the potential role of non-planar peptide bonds in beta sheet twisting. P.C. Weber & F.R. Salemme, Nature 1980; 287: 82-84. Cytochrome c' turned out to be a 4-alpha helical bundle protein, so Pat Weber and I decided to look broadly among then known protein structures to understand how the structural properties of the motif lent itself to many different functions in nature, and seemed a manifest example of convergent evolution. 21. On the Evolutionary Relationship of 4-a-Helical Heme Proteins. P. C. Weber, F.R. Salemme, P. Bethge, and F.S. Matthews J. Biol. Chem. 1981; 256: 7702-7704. The cytochrome c' monomer turned out to be highly similar in 3D structure and situation of incorporated heme prosthetic group to cytochrome b562 (determined by Bethge & Matthews). Another example of convergent structural evolution. 22. Conformational and Geometrical Properties of ß-Sheets in Proteins. III. Isotropically Stressed Configurations. F.R. Salemme, J. Mol. Biol. 1981; 146: 143-156. 23. Conformational and Geometrical Properties of ß-Sheets in Proteins. II. Antiparallel and Mixed ß-Sheets. F.R. Salemme and D.W. Weatherford, J. Mol. Biol. 1981; 146: 119-141. 24. Conformational and Geometrical Properties of ß-Sheets in Proteins. I. Parallel Sheets. F.R. Salemme and D.W. Weatherford, J. Mol. Biol. 1981; 146: 101-117. 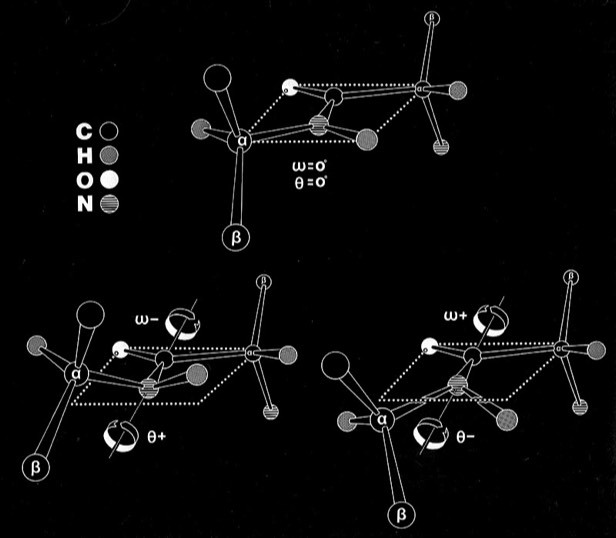 The preceding 3 papers with Dave Weatherford defined the origins of most of the major classes of beta-sheet geometry found in protein structures. 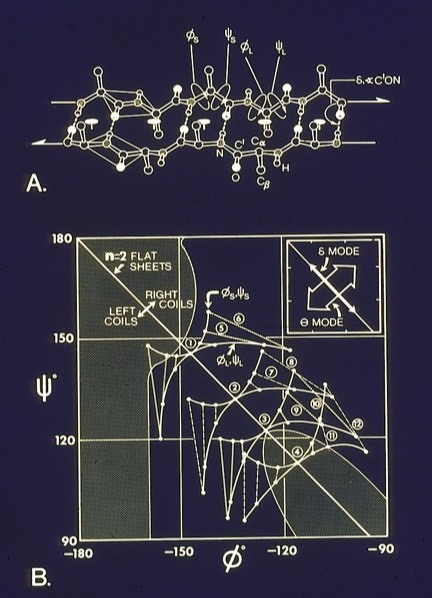 In many cases we were able to generate models with perfectly regular phi-psi geometry and essentially perfect hydrogen bonds that corresponded closely to know structures. 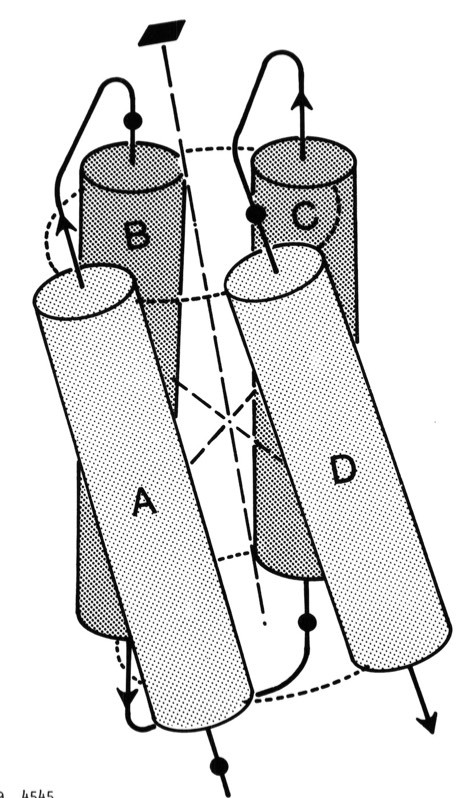 Many extended beta sheets were demonstrated to conform to classic anticlastic surfaces such as the hyperbolic paraboloid or hyperboliods of revolution (beta barrels), thus demonstrating the equilibrium distribution of forces throughout the extended structure. R. Sheridan, R.M. Levy, and F.R. Salemme, Proc. Natl. Acad. Sci. USA 1982; 79: 4545-4549. This collaboration with Ron Levy's group looked at the energetics of the 4-alpha helical structures from the perspective of dipole-dipole interactions formed by the polar H-bond chains in alpha-helices. 31. Structural Properties of Protein ß-Sheets.